If you’ve been wanting a blue cage and accessories for your hamster, you are going to find several wonderful cages to consider in today’s article. With the lovely shades of blue, one can’t help feeling drawn to them. The hamster bedding makes a pretty contrast of colors with the cages, not to mention the hamster with his/her bright eyes. In addition, there’s also the pleasing effect these lovely blue cages would have on any room. 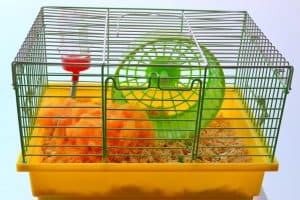 With the large variety of hamster cages available on the market, the following list may make your choice easier. Purchasing a hamster cage and accessories requires some forethought. How much space can be dedicated to the hamster cage? A simple model might suffice in a corner of the room. Perhaps, an elaborate set-up would add to the interest of the room as well as keep your hamster occupied with the many activities. Will one level suffice or should multiple levels provide a home for your hamster? After all, a model with multiple floors takes less space than a model that spreads out in a single level. 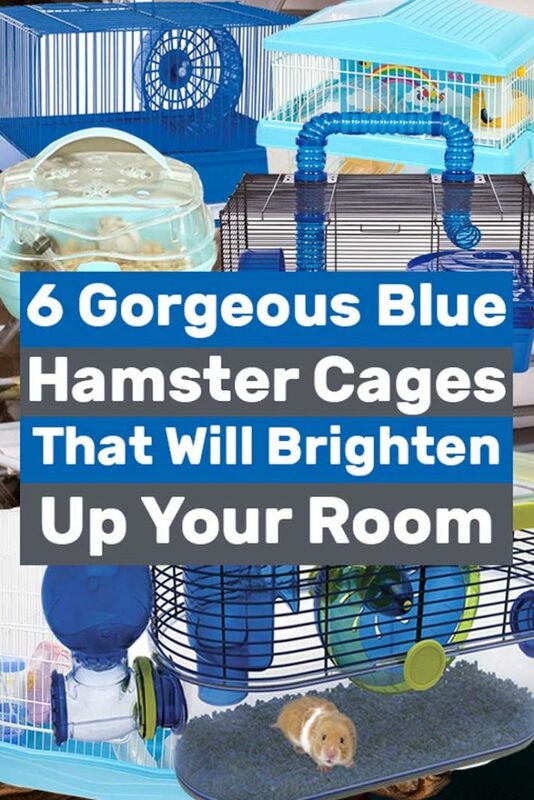 With several considerations to take into account, the following list of beautiful blue hamster cages will help you decide. And if you’re new to raising hamsters, check out our hamster cage guides here. They’ll provide you with all the information you need for buying the perfect cage or tank for your hamster. With the base, cage, and exercise wheel in the same shade of medium blue, your choice may be easy. Also, if you have an older hamster that may find it physically difficult to maneuver through a more complex cage system due to health issues, this cage could be the perfect pick. This cage is fairly small, so we wouldn’t recommend it for “full-time” living. However, it has the potential for transporting a hamster to the vet with its convenient size or as a place for your hamster while cleaning its regular cage. In particular, with a non-metal exercise wheel, there is little to no noise when in use. A top-opening door makes for fewer worries of escape. In addition, with a removable grill and a tray that pulls out, less effort goes into cleaning your little one’s cage. This model sports the dimensions of 11 inches wide and 14 inches long with a height of 8 3/4 inches and, consequently, would fit neatly in a corner of the room. Click here to know more about this convenient hamster cage on Amazon. The Iris hamster cage is a two-level habitat. Included are a water bottle, food dish, and a charming little house that is removable. Your darling critter is sure to love this two-level. A wheel will provide exercise. Instead of being constructed of four wire walls as most cages are, this cute model has a blue background with a colorful illustration of a rainbow and clouds on the back of the cage. The downstairs of the home is clear while the upstairs is constructed of white wiring. The roof and first-floor band around the cage soothe the eyes with a pale blue as does the little hamster house. Additionally, the wheel, located downstairs on the first level, is transparent to match the walls of the first level. The roof features a door for easy access to your little one. Subsequently, the ramp leading from the first level to the second for food and water shines white with texture strips to keep little feet from slipping. The dimensions measure 14.06 x 9.25 x 11.50-inches. For more information about ordering a cage with a rainbow, go here on Amazon. This lovely two-level, connectable cage promises to be an eye catcher in any room. The frame of the cage forms the first tier while the blue tube extends above the roof of the cage, has a straight middle section, and descends back down again into the first tier. The tube is a transparent, lovely shade of blue that complements the blue base of the first tier. Any hamster or dwarf hamster that enjoys climbing will frequently make the circuit. The ridged design of the tube allows for easy climbing. Also, in a complementary shade of blue is a curved shelf formed in small steps with an exercise wheel. 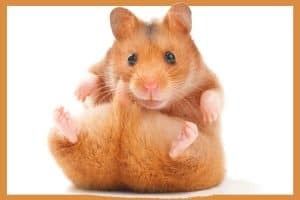 In addition, the size of the cage, at 20-1/2 inches long, 16 -1/2 inches wide, and 19-1/2 inches high, allows for larger hamsters to reside and climb comfortably. Take a look here for additional details about this cage on Amazon’s web page. This cute cage is perfect for keeping your hamster in while cleaning his/her cage, trips to the vet, or short outdoor trips. This cage includes a water bottle and has a grid on the bottom of the cage to increase ventilation. Constructed on the top and bottom with plastic instead of wiring, the Misyue portable cage sports a pale blue on the base. Misyue designed the top to be transparent, and hinges allow for the opening of the cage. Although this portable cage meets a need for transportation and cage cleaning, its 5.5*8*5.1 inch dimensions would not support a hamster’s day to day needs and should be used temporarily only. The cage has a carrying handle. Make sure the cage closes securely before picking it up by the handle. For more information about this transport cage, check out Amazon’s website here. If you’re looking for something a little different, the oblong Habitrail Twist Hamster Cage may fit the bill. The cage is transparent, with transparent accessories that are an attractive shade of blue. The base of the cage is transparent and deep to prevent bedding from being kicked out of the cage. Although the size of the Habitrail Twist is adequate for a hamster at 8.5inches length x 20.5 inches width x 10 inches height, the Habitrail cage is compatible with all other Habitrail components, so you can add on and enjoy building a world for your lovely hamster. The blue exercise wheel is noiseless. Your precious pet can enjoy playing on the wheel to his/her heart’s content at night without disturbing anyone. The top of this unusual cage lifts off for convenience. In addition, there is outside access to the water bottle, and the base snaps off for easy cleaning. For more fun, rearrange the items when you clean the cage. Your hamster will love the extra exploring in his/her clean surroundings. Look here on Amazon for more information about this cage. With a lovely blue base and tiers, you can’t go wrong with the GNB Hamster Habitat. In addition, this is a tri-level cage that includes not just one, but two slides, a bedroom, exercise wheel, food bowl, and water bottle. The cage is easy to put together. With the three levels, your tiny one is sure to enjoy exploring his/her surroundings as well as having the bedroom when wishing to hide for a bit. The white cage allows for ventilation from all four sides. The dimensions are 14x10x16 inches and is an ideal size for carrying also. 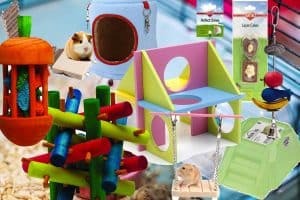 Dwarf hamsters and hamsters will love their new surroundings. Click here for more information about this interesting hamster cage on the Amazon website. Which of these lovely cages caught your eye? Tell us why down in the comment section. We love hearing from our readers.